Appleby's coloured unpasteurised Cheshire would be on the list as it is similar to the Cheshire my mother used to buy in years gone by; this is a cheese I grew up with and is still one of my favourite cheeses, great texture and flavour and it is very acidic which gets the juices flowing. They are also really nice guys, I see Gary the cheese maker each year at Nantwich. I think a blue as I like a good blue, so let's go traditional and choose a well made, old fashioned Stilton, I love that balance of rich creaminess with salty, tangy blue. Sometimes when I see price drives in supermarkets, it makes me sad to feel that this very noble, English cheese could be under valued and taken for granted. My favourite cheddar is Montgomery, another unpasteurised cheese and needs no explanation. 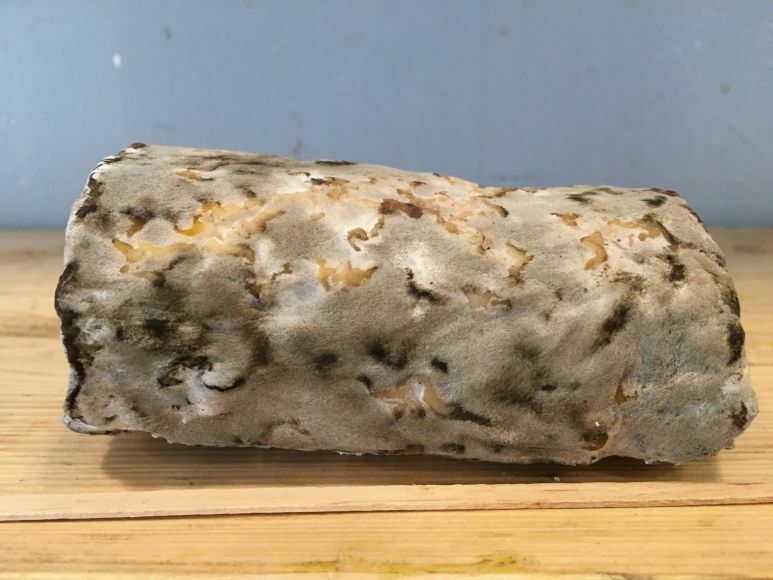 I like soft, squishy full flavoured goat cheese which is why I invented the Batty and Jericho, so I would take maybe a French Chabichou which is a soft cheese made with geotrichum that gives it is wrinkly rind. I can admire how well made it was whilst devouring its rich creaminess. Could I take some of our Ribblesdale goat curd so that I could either have it plain (I would bring a bucket!) or flavour it with different things I found on the desert island, for example, honey or fruits or herbs if there were any growing in the wild. Freddie Mercury...yes, I know...but he would have been a hoot, wouldn't he! How about Joanna Lumley - she can bring the bolly and I can bring the cheese. Root, a character from Person of Interest. She shoots with a gun in each hand, refers to humans as being 'bad code' and can change character at the drop of a hat. She would have lots to talk about and I would listen, it would be a fascinating cheese board chat. Sir Ian McKellen - what a talented chap, I reckon he would know his way around a cheese board or two and would have some wonderful, gossipy tales to tell and be a good all round cheese board companion. 3. What is your favourite cheese joke? A farmer goes out to his field one morning only to find all of his cows are frozen solid. As far as the eye can see are cows motionless like statues. It had been a bitterly cold night, but he'd never thought anything like this would happen. The realisation of the situation then dawned on him. With his entire livestock gone, how would he make ends meet? How would he feed his wife and kids? How would he pay the mortgage? He sat with his head in his hands, trying to come to terms with his impending poverty. Just then, an elderly woman by, "What's the matter?" asked the old lady. The farmer gestured toward the frozen cows and explained his predicament to the women. Without hesitation the old woman smiled and began to rub one of the cows noses. After a few seconds the cow began to twitch and was soon back to normal and chewing the cud. One by one, the old woman defrosted the cows until the whole field was full of healthy animals. The farmer was delighted and asked the woman what she wanted as a repayment for her deed. She declined his offer and walked off across the field. A passer-by who had witnessed the whole thing approached the farmer. "You know who that was don't you?" asked the passer-by. "No" said the farmer "who?" 5. What is the most unusual place you’ve ever eaten cheese? A very soft and warm cheese on a dive boat in the water around Australia a long time ago. 6. When you eat out do you have the cheeseboard or pudding/dessert? 7. What would you pair with your wonderful cheeses? So there you have it. A unique insight into the mind of Ribblesdale Cheese's Iona Hill. You can buy delicious Ribblesdale cheese in our online shop. We have Ribblesdale Superior Goat, Batty and Ribblesdale Mature Sheep.